Good morning. I pray your week has been a productive one. October is reserved as Domestic Violence awareness month. As the month reaches a close, I would like to share a poem written for Domestic Violence Survivors. It’s important that we become aware of the issues that are plaguing our community. Domestic violence takes place 365 days of the year. Take time to educate yourself on warning signs because it might save your life or someone elses. Be blessed. NOW I’M HEALED AND MOVING TOWARDS MY DESTINY! I was Broken, but now I am HEALED! Domestic Violence victims can become VICTORS! Seek God on how you can help and educate those around you! Good morning! Happy Monday to you all. I pray you had a blessed weekend! 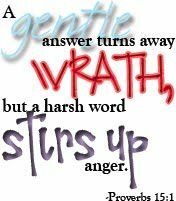 15 A gentle answer turns away wrath,but a harsh word stirs up anger. 2 The tongue of the wise adorns knowledge,but the mouth of the fool gushes folly. Have you ever encountered a person(s) who constantly seem to push your buttons? You know, the one who always has something negative to say, perhaps they question every move you make, or maybe they rain on your vision parade with doubt and pessimism. No matter what they do they seem to pluck your nerves more than making you feel good. How do you typically respond to a person like this? I know the flesh sometimes wants to rise and tell the person(s) to SHUT UP and SIT DOWN somewhere, but that’s not Christlike. I want to remind someone today, there is power in your response. It is very difficult for a nasty and negative person to continue with their antics while you are being nice to them. Please note, I didn’t say it was impossible, because some people are just evil, but it proves difficult for a person to argue with you if you don’t argue back. You see, sometimes you will be tested and provoked in order to see your response. Not only will the enemy dispatch his troops to try to trip you in your walk, but God will test you in order to groom you. Have you been preparing for the test? The only way to deal with difficult people is to saturate your mind, body and soul with the things of Jesus. I will be honest with you, I can’t be holy without serving the HOLY ONE. I can’t even comprehend loving my enemies as myself without sitting at the feet of JESUS for advice and guidance. I can’t even begin to pray for those who have abused me or forgive those who have spitefully used me without being overtaken by the will of God. In order to prepare for the test, you must spend more time with Christ. Please note this is an ongoing process and has no expiration date. You must spend time with Christ DAILY because you will encounter a different test daily. The WORD of GOD says, a gentle answer turns away wrath, so Children of God, seek God on how to speak to one another! When someone is being nasty to you, ask God to place grace on your tongue so you can speak kindly to them. A person cannot argue with you for a long time if you won’t argue back! A person can’t continue cursing you out if you are saying, “I pray God restores the broken pieces of your heart.” The more time you spend with God the easier it will become to speak with love and kindness even to those who try to provoke you. There is power in your response! STOP YELLING, CURSING and BLAMING folks. Start speaking a soft kind word to others and watch the atmosphere change. The next time someone tries to come at you sideways, pray for God to give you a soft answer. If you can’t speak with grace, excuse yourself until God gives you the words. Our flesh will get us in trouble, but GOD will lead us to redemption. Be intentional about what and how you speak today! Have a blessed day! Good morning! I pray your week is going well. I’m still adjusting to my new schedule and prayerfully will get my blog schedule back on track. 9 How can a young person stay on the path of purity?By living according to your word.10 I seek you with all my heart;do not let me stray from your commands. 1 You, God, are my God,earnestly I seek you; I thirst for you,my whole being longs for you, in a dry and parched landwhere there is no water. In life, it’s not important to take large steps towards your future, rather it’s important to make consistent small steps. Consistent small changes in your habits, attitudes and actions will lead to a HUGE impact on your life and the lives of others. As Christians, it’s vital that we consistently seek God. It’s not important if you can read the bible in 90 days or if you can memorize every scripture from the Old Testament to the New, what matters is that in your personal relationship with Christ you are consistently seeking Him. Psalm 119:9 ask, how can a person stay on the path of purity? The answer is by living according to God’s word. How can you live according to God’s word? I’m glad you asked. In order to live according to His word, you must be familiar with His word. The only way you will grow familiar with the Word is by reading and studying it on a CONSISTENT basis. I will be honest, I have never read the bible in its entirety, but that doesn’t make me less saved than the next person. My walk and relationship with Christ is different from the next person. What I can say is that I have a consistent devotion time that allows me to meet with my JESUS daily and not just once a day. I want to encourage new believers, believers who may have fallen back into old sinful ways and even believers who think they are doing well, to consistently make time for Christ. Consistently pray to Him, read and study His word, attend a local church, seek Him on serving in ministry or leading a ministry, consistently ask questions so you can seek God to help you find the answers. It’s important to consistently make small steps towards your purpose and calling. God just wants you to be consistent. Little means much when it’s done consistently! Good afternoon! Happy Thursday to you all! Praise the Lord, the government shutdown has ended!!! I apologize for the incomplete blog this morning. I tried uploading the blog from my cell phone and experienced some technical difficulties. But no worries, I remember what God placed on my heart. 9But you are a chosen people, a royal priesthood, a holy nation, God’s special possession, that you may declare the praises of him who called you out of darkness into his wonderful light. Now I am not a professor, but I bless God for the image that is displayed when I make my entrance. God blessed me with the following reply from the cashier, “You walk with authority.” *MIND BLOWING* As children of God, we are a chosen people, a royal priesthood, a holy nation, God’s special possession and when we walk into a room people should notice a shift in the atmosphere. There should be a level of spiritual authority that oozes from your skin. There should be an obvious separation from yourself and a non-believer. Do you have the look of authority? Now I have only been at this new institution for five days and if someone can associate me with my place of employment after that short length of time then surely I should be recognized as a child of the KING after 21+ years of service. Do you have a look of authority on you or do you look the same way you did before you accepted Christ? I owe who I am to Christ. This Christian walk should not be a game but a lifestyle. You shouldn’t pick and choose when you will serve the Lord, but you should make a conscious effort to serve Him daily. (24/7) I humbly submit my will to the will of God and the only reason I look different now is because Christ made me a new creature and old things passed away (2 Corinthians 5:17). The only reason I look different is because I have made up in my mind that I am a child of the King and I need to conduct myself as such. Do you have the look of authority? It’s time to move forward and grow! Good morning! Happy Monday. I pray you had a blessed and productive weekend. Last week it rained almost everyday. Some days it rained so hard that streets began flooding and massive puddles emerged. Listening to the commentary of people near me, the rain made them feel sad or got in the way of their plans. I even caught myself complaining about the rain. And God being God, took a moment to minister to me through nature. Rain is a necessary part of cleaning our environment as well as providing the trees and grass with water. 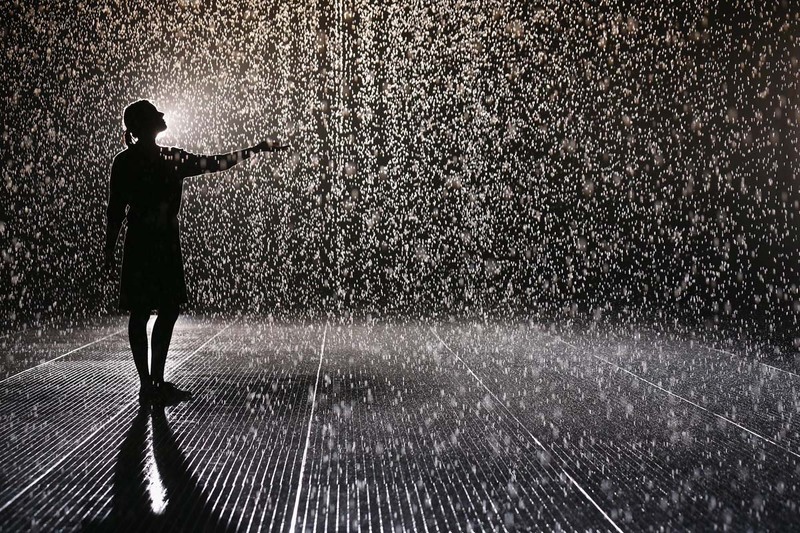 Although we know that rain is important, we only want it every now and then. We don’t want it when we are having an outside wedding, during a picnic, field trips, or when we plan to go on vacation and the list goes on. Don’t complain about the rain because you never know how it will contribute to your life. When it rains, dry places are replenished. When it rains a lot, flooding is possible. When it rains, dirt is swept away. All of these things happen in the natural. Now in the spiritual, while God reigns with all power and authority, He begins raining down in your life by replenishing and restoring the dry places. When God consistently shower downs blessings in your life a flood can take place producing an overflow. When God reigns as the Supreme judge, He begins purging you of your sins. I don’t know about you, but I will think twice before I complain about the rain. Allow nature to take its course and instead of complaining about the rain, give God thanks for the rain. Good afternoon! Happy Wednesday to you all! It’s raining in my neck of the woods, but the SON is still shining! Life is all about perspective. Choose to be positive and find the blessing in every situation! This morning I was packing my lunch bag and I noticed my large water bottle on the counter near the sink. I couldn’t remember if I sat it on the counter to soak or if it just had old water in it that needed to be emptied out. At first glance the liquid in the bottle looked like plain water. Then I decided to pick up the bottle and shake it. Once I shook the bottle, bubbles began forming. I smiled because God had just ministered to me through a water bottle. At first glance you may appear to be sitting still; average and ordinary. And it’s not until someone or something shakes you up that your potential is revealed. Greater lives within you and it’s time for you to stop sitting on your spiritual gifts and tap into your potential. Allow God to shake you up from a stagnant state and ignite the fire that is within you. You have to embrace the greatness that is within you. You have to declare that Greater is in you. You have to believe that you are greater and operate in a spirit of excellence. As Christians we serve a GREAT God and are filled with His power, but we have to stir up the gifts that are within us in order to share God’s greatness with others. It’s time to tap into your potential! 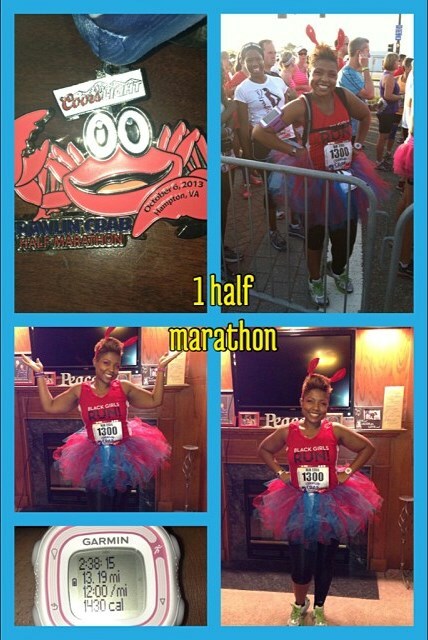 Yesterday, October 6, 2013, I ran my first official half marathon. That is 13.1 miles! Since this is a half marathon there is a saying that you are only “Half crazy”, which is so appropriate. Yesterday was extremely hot and tested my mental, emotional, spiritual and physical state. There were times I wanted to give up. There were other times I wanted to cry. There were moments where I felt empowered and even moments I felt weak. I spoke to God throughout the entire race. I told myself to run my own race at my own pace. It wasn’t about beating anyone or keeping up with anyone. (Side Note: Kingdom people: Don’t try to compete with other people. Just run your race at the pace God has given you. Don’t become consumed with winning, resolve to finish strong). This race was about stretching my limits and God truly stretched me. Philippians 4:13 gave me hope. I had to tap into where my strength came from. My strength comes from the Lord. I am so strong because I serve a strong God! I can truly do all things through Christ who strengthens me. I believe that thing more than ever now. This time last year I ran my first 5k (3.1 miles) and thought I would die and now a year later I ran 13.1 miles and can’t wait to run the next one. Yeah, I’m half-crazy! This morning I began thinking that not only am I “half-crazy” to run a half marathon, but I’m half-crazy to believe that my God will do what He said He would do. God told me that I can do ALL things and I’m half-crazy to believe that I can. I know that the best is Yet to Come and I’m going to take my half-crazy self and praise God daily, I’ll serve Him daily, I’ll spread His love with others daily, I will pray daily and I will life my life with PURPOSE! How many people are crazy about the Lord??? Excuse me while I shout!!! God has transformed me from the inside out. Spiritually I’m stronger than I’ve ever been, emotionally I’m restored, mentally I am sound, physically I am a champion. I serve a mighty God!!! So I’m going to take my half-crazy self and praise God for the rest of my life. Good afternoon! Happy Wednesday to you all! I am praying for the country during the government shutdown. Remember God is still in control. TFTD: Let the baggage go! You have been called to a higher level, but you can’t get there if you are carrying unnecessary stuff. 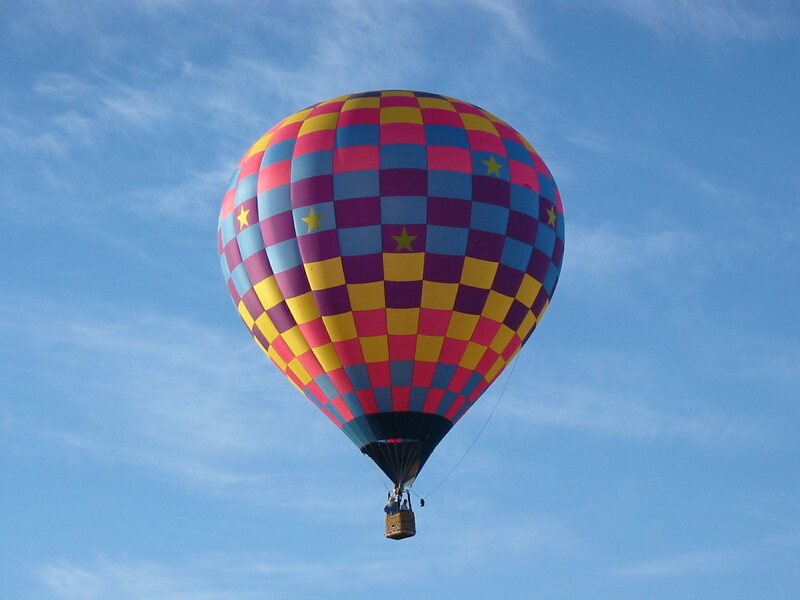 Picture a hot air balloon, it was designed to float in the air and depending on the size of the balloon it has a limit to how much weight it can carry. Now imagine someone placing bricks in the basket of the hot air balloon. When the operator goes to light the flame that fuels the balloon to fly higher it will not move. There is too much stuff weighing it down. The weight restrictions have been ignored and the hot air balloon is ineffective. Much like the hot air balloon, you have restrictions on how much “JUNK” you can carry. It’s time to let the baggage go so you can fly high! Jesus wants to fill your life with purpose but some of you are too busy trying to carry drama, unnecessary people and man-made things with you. Let the baggage go! You are trying to carry people who are weighing you down and making you ineffective in the kingdom. Stop trying to save people who aren’t assigned to you! When you take on people’s burdens when God hasn’t released you or equipped you to help them then they become baggage. I know you had good intentions and you are trying to help, but God didn’t tell you to help. Now this person has become a distraction, a burden and a form of baggage. Every time you try to go higher this weight keeps pulling you down. I encourage you to seek God and learn to LET THE BAGGAGE GO!!! What do you have to let go of today? Take a moment to look at how much baggage you are carrying and ask God to help you get rid of it. It’s time to fly high and in order to go higher, you must LET GO and LET GOD!